Tempest is one of the classics, released in 1981 by Atari. Using state of the art graphics for that time, it provided the traditional addictive high-score gameplay prevalent at the time. You pilot a ship that follows a vectored playfield, which is either a loop you can circle or a playfield with a definitive left and right side. Different enemies and attacks come from the depths of the playfield, and you have to circle the field and take them down before they or their projectiles get to you. It's a classic addictive gameplay that doesn't really need a lot of tweaking, and it really hasn't through the years, for Tempest 2000 in '94 and Tempest 3000 in 2000. Hence, we now get Tempest 4000 here in 2018. I never got to play any of the sequels since, but I did run Tempest back on the Atari. 4000 keeps the retro flair with everything done in vector graphics style, including all text on the screen. The upgrade allows there to be beautiful trancelike patterns behind the gameplay, as well as a thumping beat to keep you entranced. By and large, it definitely feels like a natural evolution of the series. It definitely has the progression logic down, how it feels impossible even on the first level, but once you get the hang of enemy patterns you can fly through levels with finesse. New abilities have been added since the original edition, such as getting an AI support or the ability to jump and dodge enemies that make it to the top of the play field. If I have any complaints about the game, it may be the control scheme. I remember playing the original with a paddle style controller with a rotating wheel, that intuitively made sense in the looping levels. The analog stick is used to move left or right, which stays in the same moving direction when "upside down" in the loop. I wish you could make it to where your position on the analog radius matched the place in the loop, or maybe use the shoulder buttons to go clockwise or counterclockwise, but I only was able to see the one control scheme, which to be honest was a little loose at times. I would have preferred your ship to stop on a dime but it seems to wind down. Perhaps it adds to the arcadey-ness of it all, but I would rather have precision. Sometimes the special graphics will overflow the playfield, or the field itself will warp, which leads to some chaos, but I won't hit the score for that one as I'm sure that's a welcome challenge to masters of the game. With three game modes (Classic, Pure, and Survival), over 100 levels, and leaderboard integration, a true arcade lover will easily pick this title up, but it may be a little simplistic for those who don't like traditional arcade gameplay at it's $30 asking price. The further you get, the further you can start next run, which makes progression a little easier, but it still boils down to a traditional "play till you die" mechanic of old. Tempest brings the classic 80's title to modern consoles, mixing the traditional action with modern visuals, perfect for original fans or those looking for some retro twitch action. 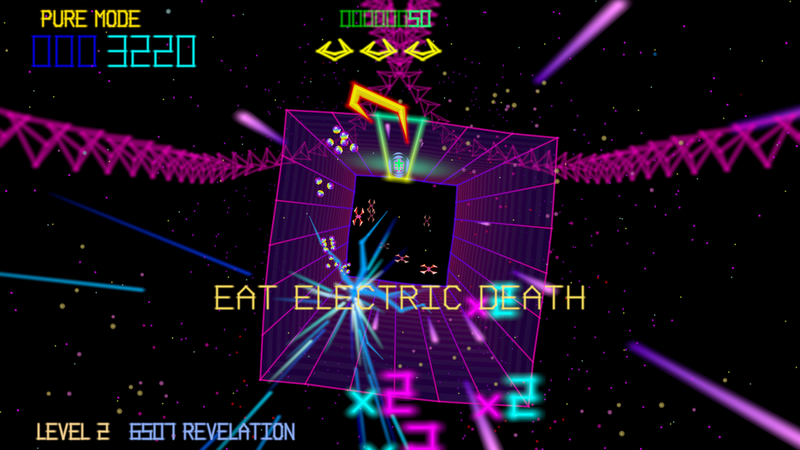 Special thanks to Llamasoft and Atari for providing a code for review!